A new smart ink that turns 3D printed objects into shape- and colour-changing forms will add even more functionality to 3D printing techniques available today. Developed by researchers at Dartmouth College, this advancement will enable form-changing printing, opening the door to 4D printing while further reducing the cost of printing precision parts for a broad range of applications. The 3D printing technology available today prints shapes that don’t reflect the molecular properties of the material; this results in hard plastic objects with rigid, but random molecular architecture. With the new smart ink innovation, designers can retain specific molecular alignments and functions in a material and convert those structures for use in 3D printing. The researchers employed new techniques in the pre- and post-printing processes to reduce printed objects to 1 percent of their original sizes and with 10-times the resolution. Using supramolecular pillars, they were able to repeatedly expand and contract the 3D printed objects in size while fluorescent trackers were used to make the objects change colour in response to an external stimulus such as light. The smart ink can print at a rough, 300-micron resolution, with the end product featuring a much finer line width of 30 microns. 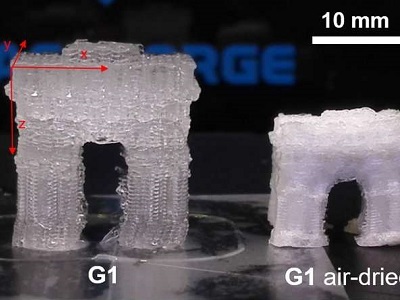 The ability to reduce the size of an object after printing while preserving all the functional features and increasing the resolution, will allow low-cost printers to print high-resolution objects, otherwise possible only with more sophisticated printers. The new smart ink innovation will find application in printing precision filters and storage devices, with researchers expecting the process to result in a new class of macroscale 3D printed objects that can be used to deliver medicine or produce high resolution bone replacements.